Randy Gage Risky is the New Safe: The Rules Have Changed . . .
Risky is the New Safe: The Rules Have Changed . . . 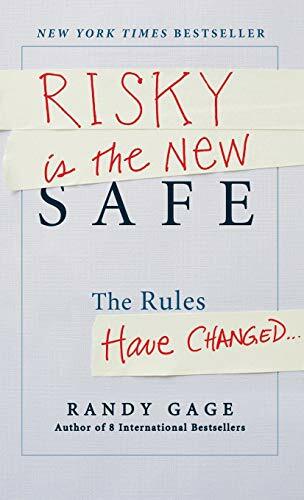 THE NEW YORK TIMES BESTSELLER and #1 WALL STREET JOURNAL BESTSELLER Risky Is the New Safe is a different kind of book for a different kind of thinking--a thought-provoking manifesto for risk takers. It will challenge you to think laterally, question premises, and be a contrarian. "Risky is the New Safe is eye opening, mind blowing, and gut real. It gives you a step-by-step blueprint for succeeding in today's new world. If you are an entrepreneur, a businessperson, or want to create wealth in your life, you HAVE to read this book!" "Holy crap, I love this book! It's smart, entertaining and best of all, made me re-think my life and my business. That's a winning combination I find irresistible." --LARRY WINGET, five-time New York Times / Wall Street Journal bestselling author, including the #1 bestseller, Shut Up, Stop Whining, and Get a Life! "Couldn't take my eyes off this great freaking book! Risky is the New Safe is a combination of Buffett, Springsteen, Rand, and Patton. Randy Gage is the ranking intellect of prosperity in our time, and only Luddites will ignore him. He has, yet again, written of the promise of abundance, the appeal of change, and the vast value of new and emerging relationships. There's nothing risky about buying this book except forgetting to do anything else while you're engrossed in it." Disruptive technology, accelerating speed of change, and economic upheaval are changing the game. The same tired, conventional thinking won't get you to success today. Risky is the New Safe is a different kind of book for a different kind of thinking. It's a thought-provoking manifesto for risk takers. It will change the way you look at everything. You'll stop seeing challenges as obstacles--and instead recognize the opportunities they provide! RANDY GAGE is a classic American rags-to-riches story. A high school dropout, Randy rose from a jail cell as a teen, faced down addictions, getting shot, and near bankruptcy before becoming a multi-millionaire. Today, Randy is considered one of the preeminent experts on prosperity and success in the world. He shares the lessons learned from his own adversity to help people and companies all over the world create wealth and success. Where others see only challenges, Randy reveals how to discover hidden opportunity. He's bold, brash, sometimes controversial, but never boring. His tough-love approach will show you how to overcome limiting beliefs, develop critical thinking skills, and defy conventional wisdom to become successful. Randy has spoken to more than two million people in fifty countries, and his books have been translated into twenty-five languages. When he's not prowling the podium or locked in his lonely writer's garret, you'll find him playing third base on a softball field somewhere. 1. Risky is the New Safe: The Rules Have Changed . . .
7. Risky is the New Safe: The Rules Have Changed . . .